Welcome to our Dog Gone Web Site. We started this site for our son, RJ. 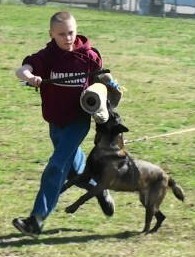 He loves schutzhund and already pretends he is a helper. He often imitates but never duplicates his Uncle Gene. RJ is a real entrepreneur at the age of three he began selling dog toys at our monthly training group, helping fund his own college fund. Since then, we have expanded the inventory to include collars, leads, muzzles, tracking lines and more.